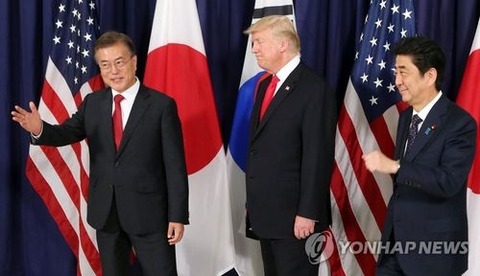 "G20 Hamburg Summit: Day 2"
"Two U.S. B-1B bombers dispatched to South Korea for joint drill"
"S. Korea, U.S., Japan pledge maximum pressure on N. Korea"
"President Moon Jae-in's First Visit to the U.S. (June 28 - June 30)"
ratio of Japanese in the total population in Korea was a little under 1 % to Taisho period(1912-1926 CE) and one in Korea was only 2.5 % in Showa period 6 years (1931). In other words, Korean people lives by an overwhelming majority in Korea. Moreover, head of a police station/judge of a court/public prosecutor/the chief of bureau in Korean government-general manager/section chief was Korean people. prefectural governor and soldiers and sailors was Korean people. In this kind of situation, ”taking Korean woman by force” is impossible.